Cherry Mobile has a photos circulating online with its upcoming handset, one of this picture is the Cherry Mobile Urban. The new handset sports a 4.5 inch qHD Display powered by 1.3GHz Quad-Core Processor, 1GB of RAM with 4GB internal storage and runs Android KitKat 4.4. It also has an 8MP rear camera and 2MP front camera. 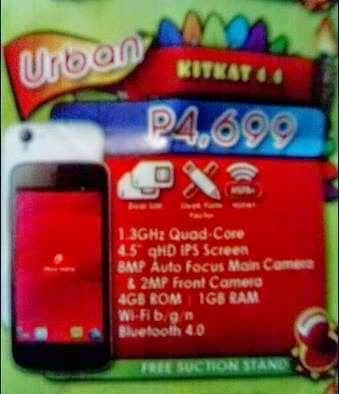 The Cherry Mobile Urban cost Php4,699.